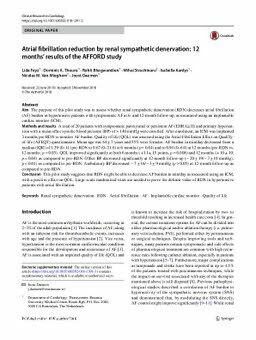 Aim: The purpose of this pilot study was to assess whether renal sympathetic denervation (RDN) decreases atrial fibrillation (AF) burden in hypertensive patients with symptomatic AF at 6- and 12-month follow-up, as measured using an implantable cardiac monitor (ICM). Methods and results: A total of 20 patients with symptomatic paroxysmal or persistent AF (EHRA ≥ II) and primary hypertension with a mean office systolic blood pressure (BP) of > 140 mmHg were enrolled. After enrolment, an ICM was implanted 3 months pre-RDN to monitor AF burden. Quality of life (QOL) was assessed using the Atrial Fibrillation Effect on QualiTy-of-life (AFEQT) questionnaire. Mean age was 64 ± 7 years and 55% were females. AF burden in min/day decreased from a median (IQR) of 1.39 (0–11) pre-RDN to 0.67 (0–31.6) at 6 months (p = 0.64) and to 0.94 (0–6.0) at 12 months (pre-RDN vs. 12 months; p = 0.03). QOL improved significantly at both 6 months (+ 11 ± 15 points, p = 0.006) and 12 months (+ 10 ± 19, p = 0.04) as compared to pre-RDN. Office BP decreased significantly at 12-month follow-up (− 20 ± 19/− 7 ± 10 mmHg), p < 0.01) as compared to pre-RDN. Ambulatory BP decreased − 7 ± 16/− 3 ± 9 mmHg (p > 0.05) at 12-month follow-up as compared to pre-RDN. Conclusion: This pilot study suggests that RDN might be able to decrease AF burden in min/day as measured using an ICM, with a positive effect on QOL. Large-scale randomized trials are needed to prove the definite value of RDN in hypertensive patients with atrial fibrillation.